rhubarb, for which i have grand plans - a new recipe for cherry-rhubarb jam! .. .. .. .. .. .. .. .. .. .. .. .. .. .. .. .. .. .. .. .. .. .. .. .. .. .. .. ..
have you ever had a dream . . .
that you dream and dream, but you sort of know it is just that. Just a dream. Fun to think about. It doesn't make you discontent with where you are right now. But it's a peaceful sort of place to go in your mind. Maybe it's fun to talk about and have as a far-off goal of sorts. Ben and I have a few of those dreams. Way back when we got married we said that we would really like to be in our house, the house we would live in for, well, forever - we'd like to be in that house by the time we are 30. Over the past 8.5 years we have looked at many houses, we have sketched out many houses, we have sketched out renovations to houses we have rented and wished we could buy . . .
We have talked about what we want to be able to do in our house: be cozy, raise our kiddos, have lots of company, host some more Bible-study groups, host parties and big meals, live, have a lot of fun, love, share, create, rest, laugh, be comforted, just be, just be us. We bought our first house in January of 2008. We've lived in it and loved on it for the past 2 years. We were thinking about adding on to it and really putting some finishing touches on it this summer. Then, someone approached us and asked if they could buy our house! Then, Ben found a deal on some land - land by a river! Land with oak trees and a hill and south exposure (sunshine!!!!!). And we are drawing again! And praying! And holding our breath. And quite possibly - this year - while we are both 30! - we could be in our house. The house we'll stay in forever! .. .. .. .. .. .. .. .. .. .. .. .. .. .. .. .. .. .. .. .. .. .. .. .. .. .. .. . .. .. .. .. ..
And thank you all so very much for all the kind things you said about me and my hair yesterday. You are some lovely friends, you are. Hugs to you all. Hugs and sunshine and warm wishes for a very lovely day. what i'm . . .
what is Friday full of? i hope it's wonderful! my new spring/summer arrangement on my living room wall. i love to look at it! "do not fret about tomorrow. tomorrow has enough worries of its own." these thoughts were inspired by this post and i don't mean these thoughts in a cliched sort of way. i really am finding them to be true and real for me. i will try to be back later today . . . i have lots to tell and visit about! and i want to pop around and do lots of reading this evening . . .
i hope that you are all enjoying some sunshine today! it's shining here! and i'm off to deliver some bread and have a meeting . . . then my kiddos and i will be playing outside! hugs to you, my friends! First, thank you for the Maddie-love a few days ago. It just feels good to share my thoughts with other moms, gals, ladies, friends . . . And good to know that my six-year-old is in good company, and so am I. In January I posted some goals for the year. I posted a picture of some dried flowers in the snow with my list. A week or so later, the mail lady delivered a box from a dear friend of mine, and inside were some "little trees" all framed up on her handmade paper. They are now hanging on my living room wall, where I see them daily and remember to pray for my friend and her husband, and am reminded of my list of goals, and I enjoy the beauty and thoughtfulness in this little piece of art. I revisited my list in February. And here goes another revisit . . .
Edited :: p.s. it isn't her birthday - she is right in the middle of being six - she'll be seven in september.
.: maddie and her cousin e :. six years old. what a funny age. some days she is six going on sixteen and others she is six going on three. what an in-between, funny sort of time. the other day she had gotten all dressed up before Ben came home, to be pretty for daddy. she had a huge, fluffy white dress on and her hair pulled back into a bun with little pieces all flying around her face. then she got cold, so she put on a soft lavender fleece jacket and zipped it right up to her chin. her pulled back hair and high collar made her look so very grown up. she is so pretty. my heart did a flip-flop. then she smiled and her smile is so funny right now! her top two teeth are just barely starting to grow in. her bottom front teeth are partially grown in and just a little crooked. she's got three other loose teeth that kind of sit at odd angles, because they are loose. nothing grown-up about that dear, dazzling smile. but that smile just screams change. it pushes in my face the fact that this little girl of mine is no toddler any more. she's not even a kindergartener. she is 6 1/2. she is doing all first grade work. she is learning to write cursive. she reads ever so well. she read the recipe to me yesterday. she thinks things through and understands so much, from jokes to sadness to writing letters to communion to happy tears to engagements to . . . oh, man. the list goes on and on. we have had more deep talks than i ever would have guessed. we are already good friends. and i know that as she grows we will just grow closer and closer. oh, yes. i am her mom. there is no question there. there is authority and respect. but we are friends, too. the very best. and i want it to stay that way. i want to always be the first person she asks when she has questions or worries. i want always to be the first person she shares joy and good news with. i love her happy little grin. and her melancholy moments. oh, yes. she has those. just like her mama. goodness. she is like me in so many ways.
.: maddie and her cousin jace :. Ben laughs and smiles about how alike we are. and he wonders what it will be like when he has two girls in his life who have those days each month. but i'm not worried for him. he does a good job helping to ease those days for me. he'll be great with Maddie, too. this strange, in-between land we are in. one moment she is curled up with one of her stuffed animals and the next she is telling me just how her wedding in going to be someday (we have lots of newly married and engaged friends and family members). sometimes she cries and wants me to pick her up, but she is so tall - just a few inches below my shoulder. one minute she is sitting like a lady in church, following along in her Bible, the next she is off and running, her skirts flying, nothing lady-like about her in the least - just everything child-like. i love to watch her learn and grow. though sometimes i'm at a loss of how to let her be six, but to help her not be too silly. i want her to grow gracefully, but not too quickly. and sometimes i know that these are things that moms of teenagers think about. and here i am thinking them about my six-year-old. but i see so many things when i look at her. i see the baby girl i brought home from the hospital, who i knew God gave to me because i needed a little sunshine in my life. and i see her jumping in her little jumper, and learning to walk, and sleeping, and toddling, and laughing, and sledding, and splashing in the lake, and turning three, and learning to read, and flying around on her bicycle, and playing dolls, and growing up - i can just imagine all the things we'll do together as she grows . . .
and - those of you who have girls who have been six, or maybe you remember being six - tell me about it. sometimes, this whole mom thing . . . well, i want to do my best. and sometimes it's so helpful to just write it down, and think it out, and talk about it. let's talk. Edited to add :: the verse-a-day today is "Charm is deceitful and beauty is vain, but a woman who fears the LORD, she shall be praised." Proverbs 31:30 (NASB) This is very much something that I want to know and that I want to teach to Maddie. Maddie and I made these yesterday . . . they are a bit of work, but we had fun! And they are very tasty and pretty! Maddie found the recipe in a little book called Fairy Cooking which she borrowed from our neighbor. I thought that some of you might like to make them, too. I didn't have raspberry jam, so I used strawberry. I thought that melted chocolate would be quite tasty also. You could certainly use other shapes: hearts, flowers, circles or a combination. This recipe is not very large. When I make these again, I will certainly double the recipe. this is one wall in our school room. but this wall needed a post all it's own. this collection spans over 15 years of my life! you can read a bit about each piece in the collage. and decided we needed it. i bought those when ben and i lived in Duluth. all the rest have been gifts. 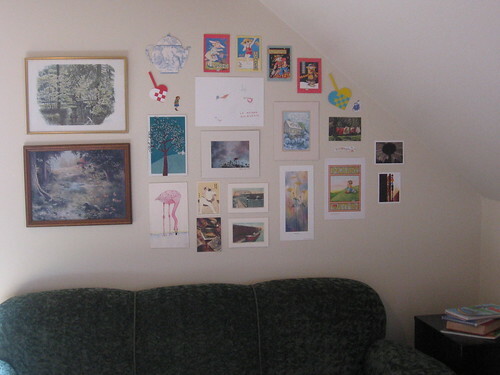 so this is sort of a memory wall. and my kiddos really love each colorful bit as well!